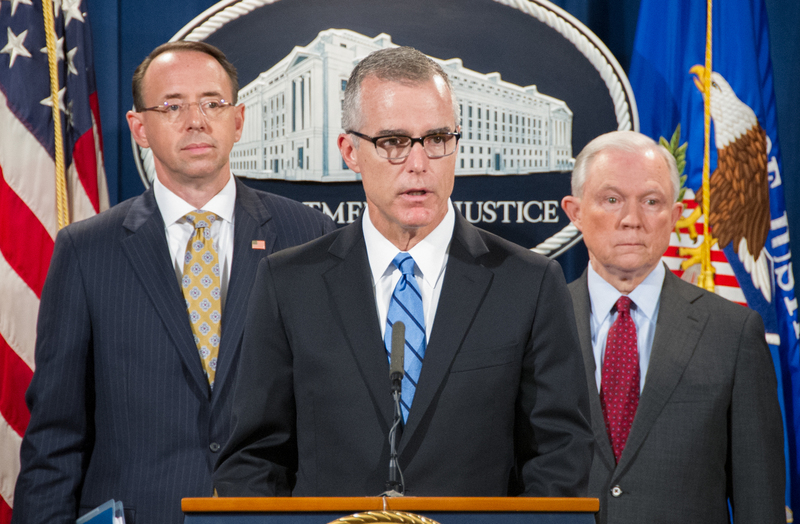 FBI Acting Director Andrew McCabe, flanked by Attorney General Jeff Sessions (right) and Deputy Attorney General Rod Rosenstein, announce the takedown of the criminal website AlphaBay, the largest Darknet marketplace in the world, at a July 20 press conference in Washington, D.C. The largest marketplace on the Darknet—where hundreds of thousands of criminals anonymously bought and sold drugs, weapons, hacking tools, stolen identities, and a host of other illegal goods and services—has been shut down as a result of one of the most sophisticated and coordinated efforts to date on the part of law enforcement across the globe. In early July, multiple computer servers used by the AlphaBay website were seized worldwide, and the site’s creator and administrator—a 25-year-old Canadian citizen living in Thailand—was arrested. AlphaBay operated for more than two years and had transactions exceeding $1 billion in Bitcoin and other digital currencies. The site, which operated on the anonymous Tor network, was a major source of heroin and fentanyl, and sales originating from AlphaBay have been linked to multiple overdose deaths in the United States. AlphaBay reported that it serviced more than 200,000 users and 40,000 vendors. 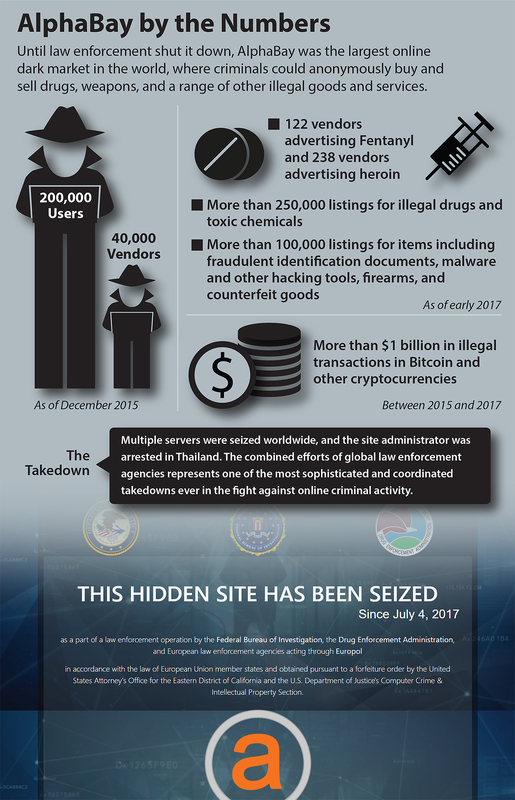 Around the time of the takedown, the site had more than 250,000 listings for illegal drugs and toxic chemicals, and more than 100,000 listings for stolen and fraudulent identification documents, counterfeit goods, malware and other computer hacking tools, firearms, and fraudulent services. By comparison, the Silk Road dark market—the largest such enterprise of its kind before it was shut down in 2013—had approximately 14,000 listings. U.S. law enforcement also worked with numerous foreign partners to freeze and preserve millions of dollars in cryptocurrency representing the proceeds of AlphaBay’s illegal activities. Those funds will be the subject of forfeiture actions. AlphaBay’s creator and administrator, Alexandre Cazes—who went by the names Alpha02 and Admin online—was arrested by Thai authorities on behalf of the U.S. on July 5, 2017. A week later, Cazes apparently took his own life while in custody in Thailand. The FBI and its partners used a combination of traditional investigative techniques along with sophisticated new tools to break the case and dismantle AlphaBay. “The message to criminals is: Don’t think that you are safe because you’re on the dark web. There are no corners of the dark web where you can hide,” Thomas said. The operation to seize AlphaBay coincided with efforts by Dutch law enforcement to shut down the Hansa Market, another prominent Darknet marketplace that was used to facilitate the sale of illegal drugs, malware, and other illegal services. After AlphaBay’s shutdown, criminal users and vendors flocked to Hansa Market, where they believed their identities would be masked. The takedown of AlphaBay—and another prominent site on the Darknet known as Hansa Market—required months of planning among law enforcement agencies around the world and was one of the most sophisticated coordinated takedowns to date in the fight against online criminal activity. The operation to shut down AlphaBay was led by the FBI and involved law enforcement authorities in Thailand, the Netherlands, Lithuania, Canada, the United Kingdom, and France, along with Europol. It is expected that hundreds of new investigations will be generated worldwide as a result of the takedowns. Europol played a central coordinating role in both cases. In early July, days before AlphaBay servers were seized, Europol hosted a command post staffed with representatives from the FBI, the Drug Enforcement Administration, and the Department of Justice, along with its own members. The command post was the central hub for information exchange during the AlphaBay operation. In parallel to these operations, Europol hosted an international Cyberpatrol Action Week in June, where more than 40 investigators from 22 European Union member states and representatives from the FBI and other U.S. law enforcement agencies joined in an intelligence-gathering exercise to map out criminality on the Darknet. The focus was on vendors and buyers who were actively involved in the online trade of illegal commodities including drugs, weapons and explosives, forged documents, and cyber crime tools. Analysis of the results and dissemination of the resultant intelligence is ongoing.